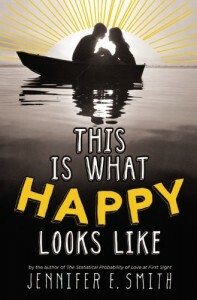 If you want a read that leaves a smile on your face, This Is What Happy Looks Like is the perfect choice! A sweet romance, a small town, and fun characters make this a great summer read that you should definitely bring on vacation!A modern day fairy tale is what this story is, really. It's not the kind of love story that's particularly believable--no one accidentally pen pals a stranger who ends up being a movie star--but if you enjoy those lightweight romance books where the story is more of a dream than anything, this one fits the bill. It's fun for a different reason; instead of being a love story that burns with the fierce realness of two people who fall in love, Jennifer goes into almost every teenage girl's dream and plucks the most famous movie star into the arms of your every day small town girl. You will likely find yourself pondering on what this would actually be like, which is fun, you have to admit! Getting to see Graham's POV also brings up what it truly means to be famous. Not the glamorous red carpet side, but how nothing you ever do can be private, and no one truly knows the real you--he even feels like a stranger in his own family. I liked how his side of the story was just as developed as Ellie's, showing us his true feelings toward his stardom; he does not rejoice being recognized by the masses. While it's impossible to relate to that lifestyle (at least for most), it's easy to understand how not all of it is dazzling. It was nice that Ellie wasn't the star struck fan that some might expect, as well. She was basically unperturbed by stars in her town--at least until she finds out who, exactly, her email buddy is. But she wasn't pretentious about the relationship at all which made her character very likeable; how many do you know who would not immediately blast Facebook with their relationship had it been them? She actually had her reasons for wanting it to be kept on the down low which creates more than a few bumps along the road between these two. Although, it remains a lighthearted read nonetheless. Like every small town, the people who reside in it know everyone else, this makes for a small but lively cast of side characters, as well as a great small town atmosphere which I genuinely felt throughout. Being from a tiny town not so different than Ellie's, I easily found myself roaming the streets along with her, enjoying the family owned quirky shops and town events. This small town garners more than just romance, too. We have some family issues that are visited throughout the story, friendship quibbles with her best friend, along with a scandal or two. Not everything is complicated, though; I especially loved Ellie and her mother's relationship. They have an easy going dynamic where they can actually talk to each other; no unconcerned parenting or melodramatics involved. And to add a great touch of charm to the story, we get snippets of emails between Ellie and Graham at the beginning of every chapter which I thought was a great way to keep the romance in the air.Light, charming, funny, and sweet, this is one you pick up when you simply want to escape into a romantic lala-land! In short, this book is what happy looks like!